This is fancy pants dinner. Easy enough for a weeknight dinner date and special enough for the holidays. Since BL and I collectively live on our island in St. Louis, hours away from any family, we’ve come to the realization that date-night-ins are going to be more and more common. We’re currently looking for an in-home part-time nanny once I return from maternity leave in January and even that feels like a terrifying step. I’m a cliche first time mom. Nervous enough to leave my babe with someone else while I’m upstairs, let alone hire someone to watch V while we go out. This is normal, right? I know it will only get easier with time, and I’m OK being glued to the hip with my sweet babe for a while longer. His snuggles are still my favorite part of the day. While this wild mushroom risotto requires a few steps to assemble, I assure you that none of them are complicated. 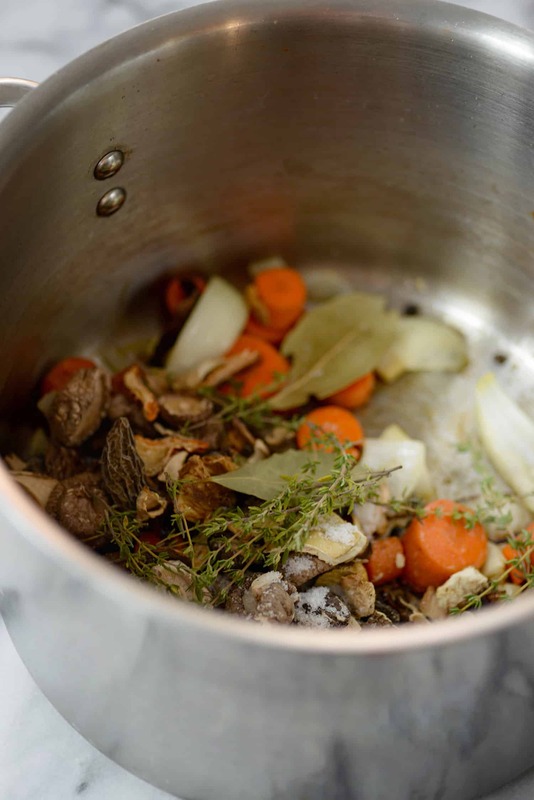 First up- make the wild mushroom broth. It’s an added touch that really elevates the entire dish. And, homemade mushroom broth sounds more complicated than it really is. 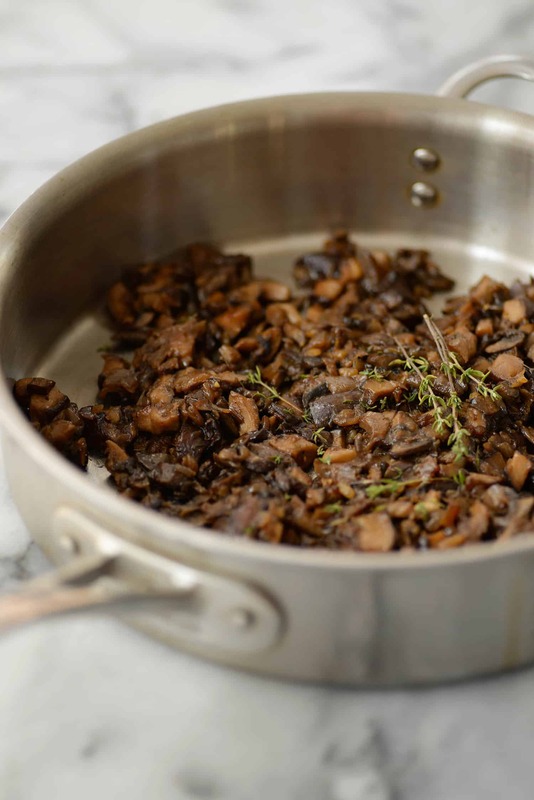 Saute a few aromatics, add in dried wild mushrooms, water and let simmer until meaty and dark brown. Strain and you’re ready for risotto magic! To my friends who cannot fathom the idea of making homemade risotto let alone homemade broth, fear not. Pacific Foods makes a super yummy mushroom broth that I recommend in a pinch. You can usually find it at Whole Foods or online. From there, we cook the mushrooms. You can make the mushrooms at the same time you make the broth, just watch them so they don’t burn. I’m using a mixture of oyster, shiitake mushrooms and baby bella mushrooms, but find whatever combination works best for your budget. You’ll want them very browned and reduced, which may take up to 30-40 minutes depending on how small you chop them. Patience grasshopper, this is risotto. After that you are simply making risotto. And, yes, I use the word simply. I know people freak out about the idea of risotto, but it’s not hard. It just takes a little bit of patience and stirring. You really can’t mess it up; add in a little warm broth to the rice, stir until absorbed and repeat a dozen times. Add in the already cooked mushrooms, a generous sprinkle of parmesan and you are good to go! My dairy-free friends, you can probably guess what I’m going to say next. I was going to make this one vegan, but then the combination of mushrooms and parmesan called to me. I love my vegan parm substitute and you could try using that, a store-bought vegan parm, or leave it out completely. Up to you. It goes without saying, but I’ll do so anyways. 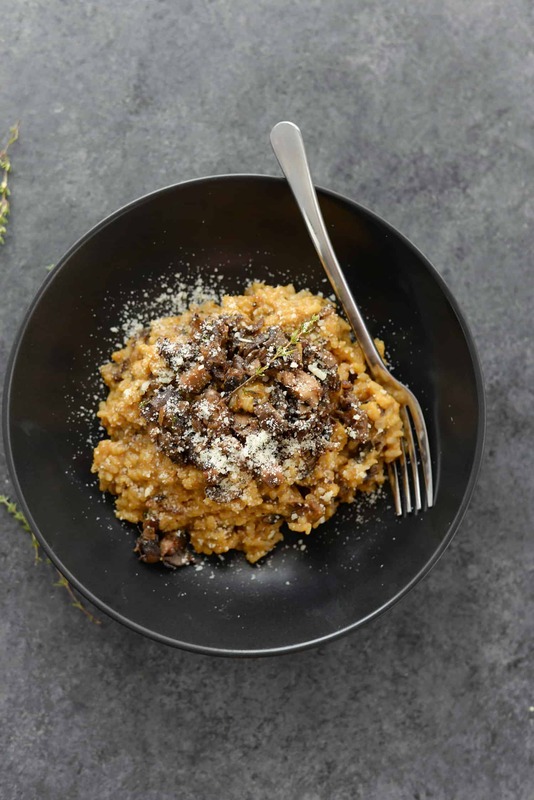 If you are looking for an elegant main to serve this holiday season, this wild mushroom risotto would be it. 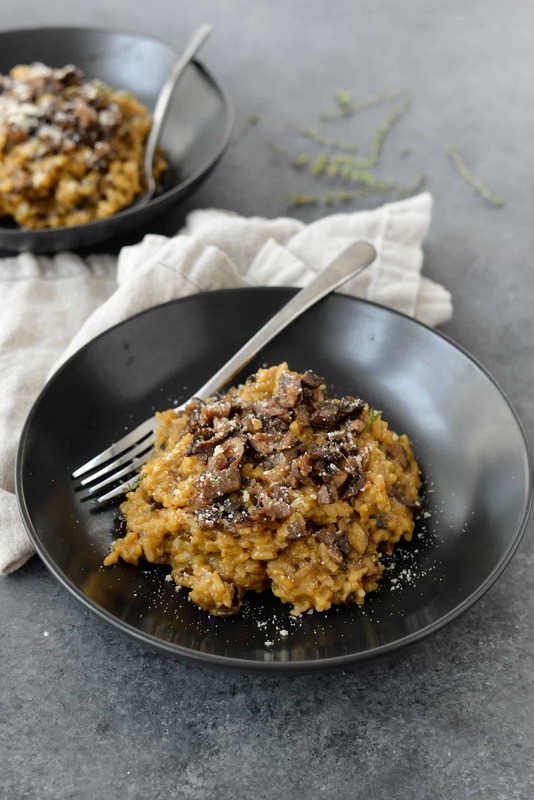 Wild Mushroom Risotto! 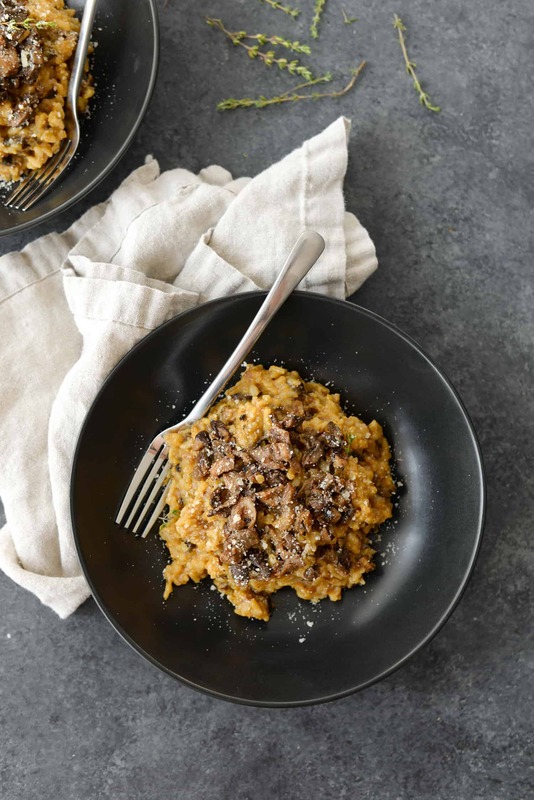 If you love risotto, you’ve gotta try this recipe. 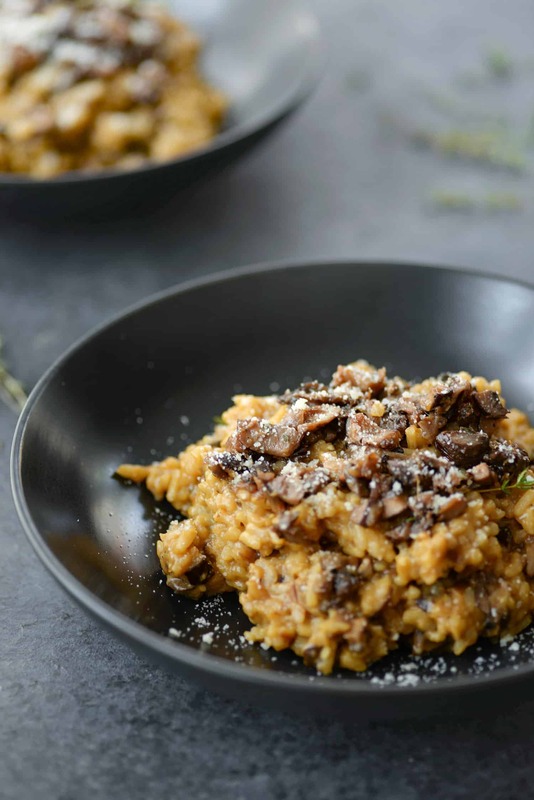 Homemade wild mushroom stock with crispy, thyme roasted mushrooms with creamy risotto. Vegetarian, easily vegan. Make the stock. Heat the olive oil in a large stock-pot over medium heat. Add in the carrot, onion and garlic and stir for 1-2 minutes to lightly brown. Add in the mushrooms, thyme, bay leaf, peppercorns, salt and water then bring to a boil. Reduce heat to low, cover and simmer for at least 1 hour. Taste for seasoning, then strain. Place back in the stock-pot and set aside for now. Make the mushrooms. Heat the butter in a large skillet over medium heat. Add in the shallots and cook until browned and very reduced. Add in the mushrooms and cook until very browned, about 45-60 minutes, stirring occasionally. Once the mushrooms have browned, add in the marsala wine and deglaze the pan, scrapping any brown bits up from the bottom as needed. Add in the thyme and cook, adding in salt/pepper as needed. I usually start with a small pinch and then go from there. Keep warm over low heat. Heat the broth in the stock-pan back over medium heat. In a separate sauce pan, add the arborio rice over medium heat until just toasted, about 30-60 seconds stirring the entire time. Add a laddle of hot broth to the pan with the rice and stir almost constantly, until liquid has been absorbed. Continue to add in broth, a laddle or two add a time, until rice is tender and cooked through. You likely don’t need any more salt or pepper, but feel free to taste and season as needed. You may not need all the broth, but wanted to make sure you had enough liquid rather than not enough. If using parmesan cheese, stir in 1/4 cup cheese into the rice. 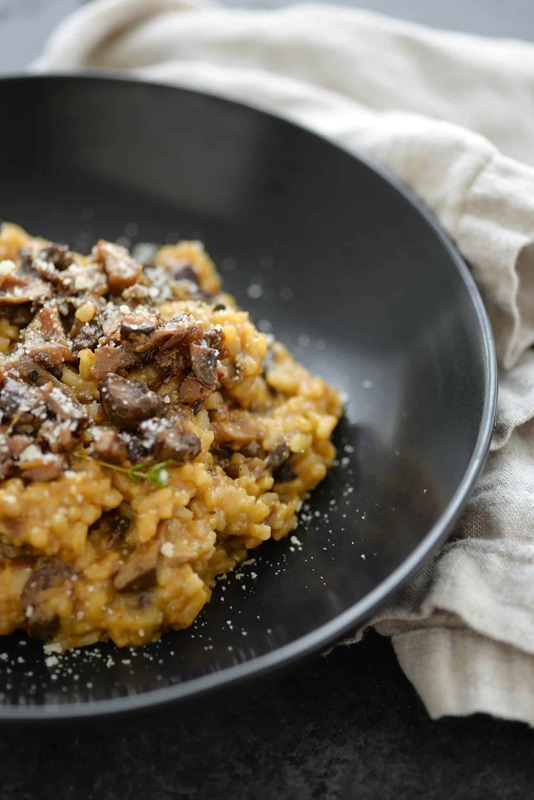 Stir in the cooked mushroom into the risotto rice and divide among four plates. Garnish with more cheese, if desired and serve. Hi Melissa- not yet, but I’ll put this on my ‘to-do’ list!